Fairbanks, Alaska (AK) – The annual World Eskimo-Indian Olympic Games (WEIO) will take place at the Carlson Center in Fairbanks from July 19 through 22, 2017. 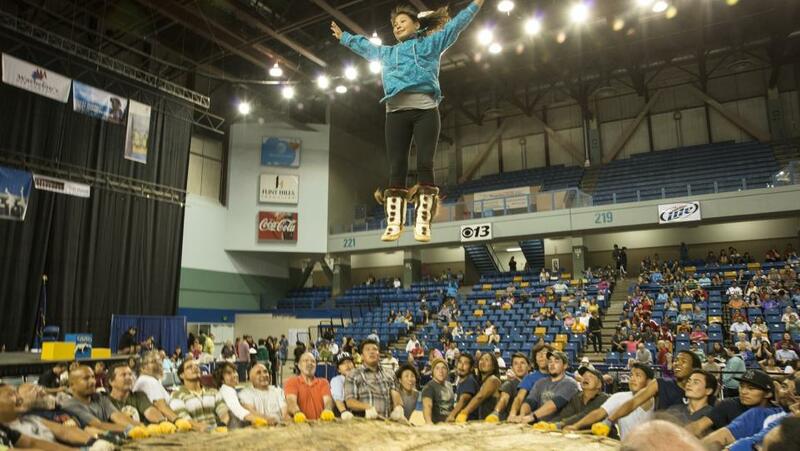 A four-day series of traditional Alaska Native athletic competitions, WEIO draws Native athletes and dancers from around the state, the United States, Canada and Greenland, as well as visitors, fans and media from around the globe. In addition to athletic competitions, WEIO also offers indigenous dances, authentic arts and crafts for sale, beauty pageants and other cultural activities. The emcee at WEIO’s Wednesday, July 19th Opening Ceremony will be the renowned Irene Bedard, an Alaska Native American actor and activist who has played Native American characters in a variety of films. Bedard is perhaps best known for her role as the title character in the 1995 animated film Pocahontas. The competitions at the Olympics give men and women the chance to test their strength, agility and endurance—all qualities that are needed to survive in the circumpolar north. Competitive games include high-kick, knuckle hop, ear pull, two-foot high kick and Eskimo stick pull. For the competitors, WEIO is a chance to meet old friends and distant relatives, to entertain and be entertained, to challenge one another and to engage in friendly competition. For many competitors, WEIO is a strong tie to their heritage and a means of ensuring that their culture is celebrated. Although the sporting events developed over many years, WEIO was created in 1961 in response to the rapidly spreading impact of western culture into rural areas. Two bush pilots, the late A.E. “Bud” Hagberg and Frank Whaley, witnessed the Alaska Native games and dances in their village travels. They grew concerned that the traditional events would be lost as western ways seeped into the villages, unless steps were taken to preserve them. They helped organize the first Olympics, which included a blanket toss, a seal-skinning contest and a Miss Eskimo Olympics Queen contest. The event has since grown to over 50 games, with an ever-increasing number of athletes. In addition to athletic events, WEIO is a time to don parkas, moose hide dresses and vests, mukluks and moccasins to compete in parka and Indian dress contests, and to dance and tell stories through songs and motion. Dressed in kuspuks—traditional summer parkas—complete with feathered fans and drums, dancers perform throughout the four-day Olympics. Spectators and participants can browse through booths of authentic Alaska Native crafts, and meet the artisans who carved, sewed or beaded the items. WEIO provides visitors the rare chance to experience a culture alongside those who live within it.